What is a Horizontal Casousel System? An adaptable and intelligent system solution for dynamic order picking processes with a very high performance level and maximum economic efficiency. 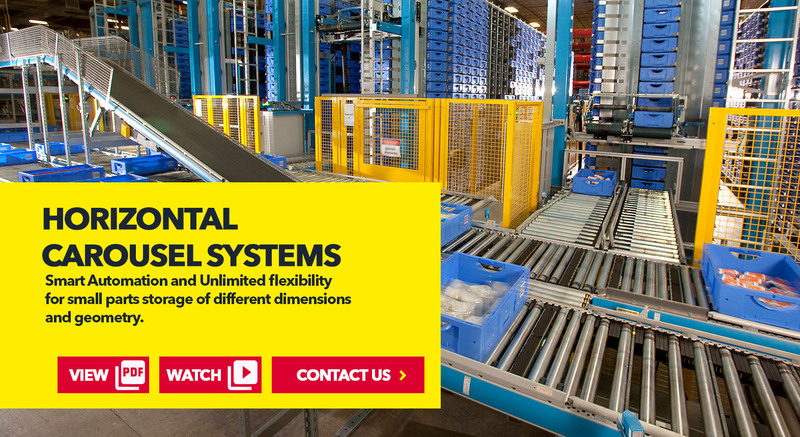 The system design combines the benefits of compact carousel systems with an innovative further development of conventional storage and retrieval systems. 1,000 picks per hour, 50% storage density increase, and the combination of a high-performance conveying system and state-of-art control technologies facilitates up to 1,000 storage and retrieval operations per hour. The decoupled movements achieved in this way allow to double the number of storage and retrieval cycles when compared to other conventional systems. Replenishment processes can be perfectly integrated into order picking operations without any loss in efficiency. Watch SSI SCHAEFER Horizontal Carousel Systems in action! Systems must provide safe reliable handling user friendly operation and an error rate measured in the thousands. The objectives are: fast access to a wide product range. The SCS Schaefer carousel system provides the ideal solution for highly dynamic warehousing and the picking task. 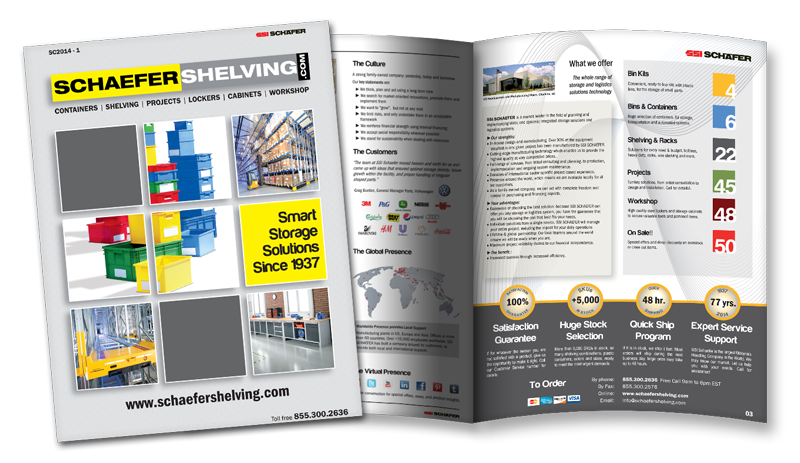 The SCS system can be used as a stand-alone system or combined with other warehousing systems. 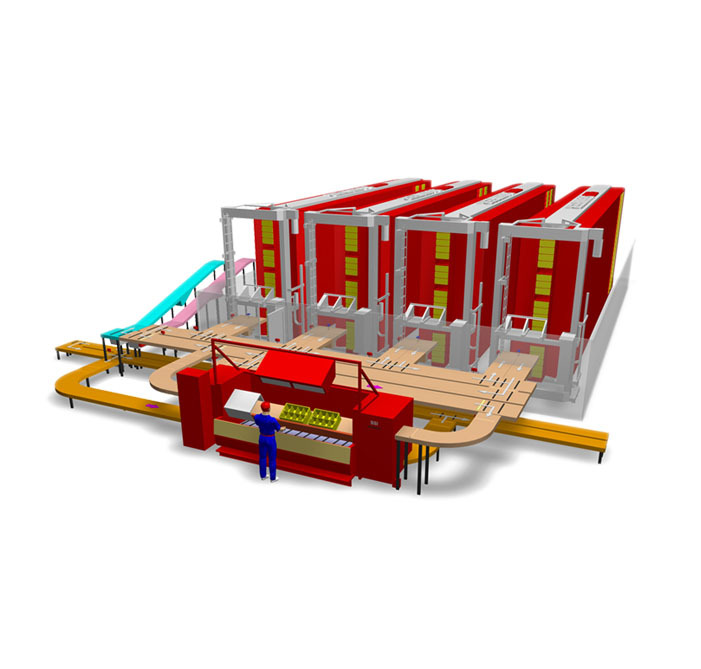 The SCS is a standard warehousing system consisting of 4 carousels and featuring the capacity of up to 6000 totes. This allows up to 1000 storage and retrieval operations per hour. The system can handle standard trays and totes as well as special totes with up to 16 compartments and a maximum weight of 25 kilograms each. When combined with ergonomic picking stations, the concept of Goods-to-Person reaches its maximum efficiency. The workstation is able to meet any required warehouse functionality: order picking, goods-in procedures, returned goods handling, inventory or other product administration activities. 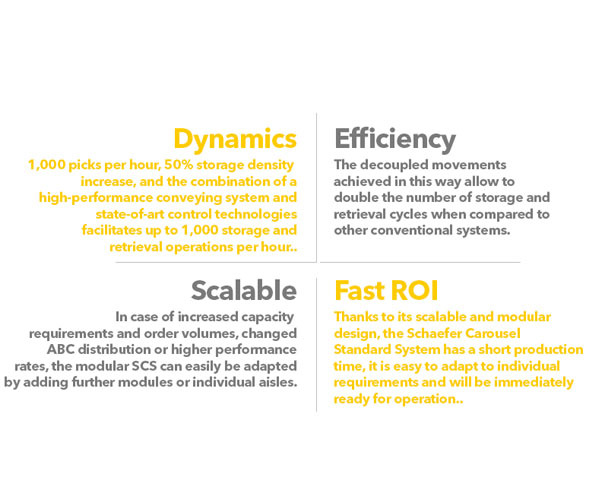 In case of increased capacity requirements and order volumes, changed ABC distribution or higher performance rates, the modular SCS can easily be adapted by adding further modules or individual aisles. The patented ergonomic design of the workstation, equipped with light guidance for picking and placing paired with drop control sensors, provide a clear operator guidance where each picking operation is guided, checked and confirmed, guaranteeing continuous high throughput rates and virtually error-free processes. Thanks to its scalable and modular design, the Schaefer Carousel Standard System has a short production time, it is easy to adapt to individual requirements and will be immediately ready for operation. These features ensure short implementation times , minimal business disruption and a lasting investment protection.